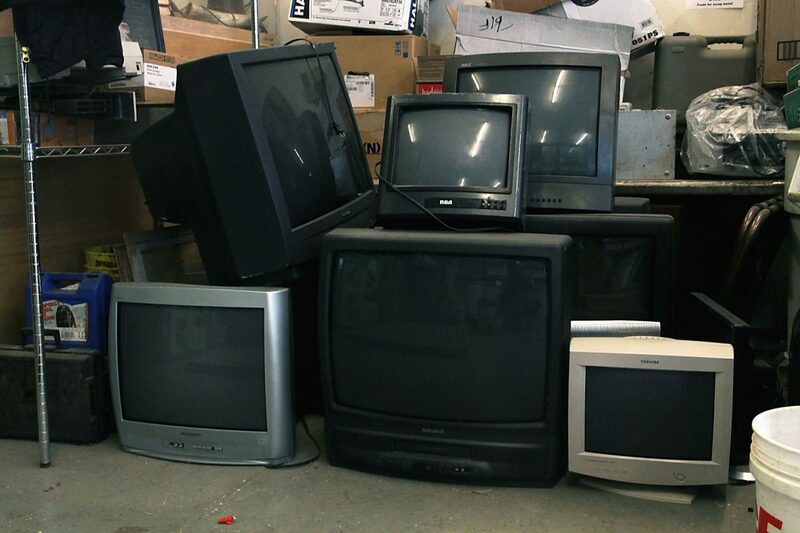 CRT televisions await processing at Precision Metals Recovery's facility off of Dolores Way in Carbondale. Nobody wants your old tube TV. The rapid march of technology has left electronics that cost thousands of dollars a decade ago next to worthless. Most local thrift shops have stopped taking computers and cathode ray tube (CRT) televisions — working or not. Not only is there no market for them in a world where you can buy a 30-inch flat screen for $150, since last summer, they’re actually a liability. The Electronic Recycling Jobs Act took effect in July 2013 and prohibits landfilling of many common devices. Instead, television sets, computers, printers, fax machines, DVD players, VCRs, stereos, video game consoles and the like — known collectively as e-waste — must be disassembled and recycled. It’s an expensive process, and although most local recyclers are either breaking even or losing money on e-waste, some of the cost is inevitably passed on to the consumer. If you show up at the South Canyon landfill with a CRT television, you’ll pay about a dollar per diagonal inch to dispose of it. Precision Metals Recovery (PMR), formerly Citewaste, will recycle stereos, amps, VCRs and DVD players for free, but take a by-weight fee for computers and televisions. PMR and the Glenwood Springs Recycle Center both send their electronics to E-Waste Recyclers of Colorado in Grand Junction. The company, which also works with Pitkin County, Eagle County and local hospitals, is the only R2 (responsible recycling) certified electronic recycler on the Western Slope. Even so, E-Waste struggles to achieve the volume necessary for an efficient operation. Shipping is a major challenge in the rural mountains. It’s costly to get items to the recycling facility and costly to ship out for further processing. CRT television glass is about 20 percent lead by weight, and must be sent to Phoenix for smelting. The glass is then recycled and the lead is then used for batteries. In the end, every piece of electronic equipment that E-Waste Recyclers of Colorado handles is either reused or recycled. The company has ramped up its operation from 300,000 pounds recycled its first year to more than 1.2 million pounds in 2013, and it’s on pace for 6 million in 2014. “The more volume that we have, the easier it is for us to process those materials,” said founder and CEO Ken Burns. Still, the region lags behind the nation in e-waste recycling. Burns puts it down to remoteness and the cost in a still-fragile economy. “When people don’t have disposable income, they’re not going to pay to recycle something,” he observed. According to King Lloyd, solid waste manager for the city of Glenwood Springs, although most people do bite the bullet and pay the fee, others are not so cooperative. Despite their best efforts, thrift and consignment shops take the brunt of the dumping. “Just about every week we have a TV on our porch,” observed Louise Holgate of Near New Store, a venerable thrift shop in Carbondale. Its volunteer staff isn’t equipped to move or dispose of such big, heavy electronics. When people ignore the signs and televisions and computer monitors pile up behind the building, someone with a pickup truck has to come and take a load to the dump. The associated fees come out of money that would otherwise have gone toward local scholarships. Community Thrift and Treasures in Glenwood Springs has been hit even harder. Recently, it installed additional signs and security cameras in hopes of stemming the flow of unsolicited e-waste. Although owner Kimberly Owen said the store is all about natural wellness and community sustainability, but its current bill for e-waste disposal at the landfill is over $2,000, more than some of the programs get from the group. Despite her frustration, Owen chooses to be optimistic. That lesson has been driven home by law enforcement, which has made a point of investigating e-waste dumping. Those they catch are usually charged with littering, which carries a maximum $1,000 fine and up to a year in jail.